Do you agree? 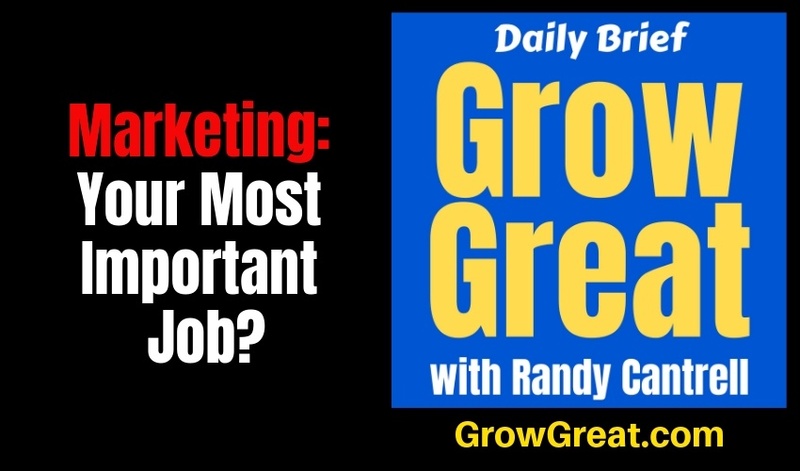 That marketing is your most important job as a CEO/entrepreneur? Branding works exactly the same way those stories work – the ones you can create versus the ones you let your employees create. People are forming opinions about you no matter what. So if you’re not branding yourself and your company, then others are doing it for you. 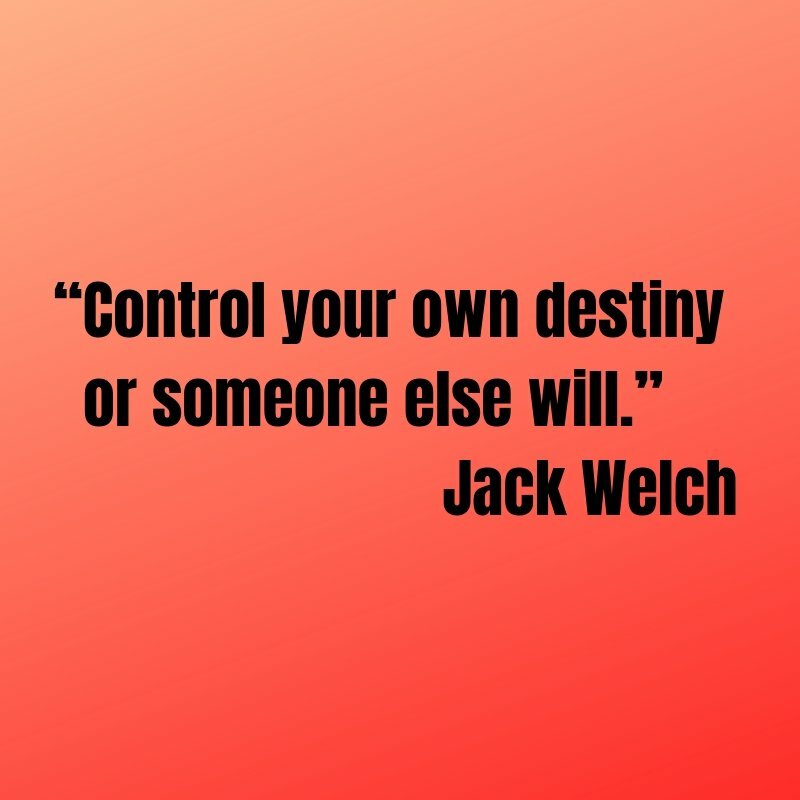 Reminds me of one of my favorite quotes by Jack Welch. Google it and you’ll find 9.7 BILLION results. Getting someone who has a need, to know, like, trust, contact and refer you. That’s as good a definition as I’ve seen. Some add a step between contact and refer, BUY. I omit because you can achieve effective marketing without ever making a sale. 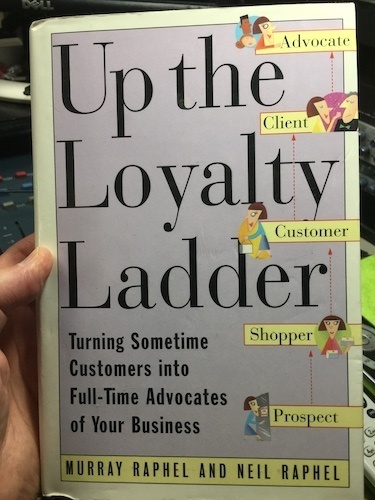 In 1995 a book was published, Up The Loyalty Ladder by Murray Raphel and Neil Raphel. I bought the book when it was first published even though I’d never heard of this father/son combo, but I read the book with interest. It distilled better than I ever could what I had always believed to be true. You can take a person from prospect to advocate without them ever becoming a customer. That’s the power of marketing. Sometime around 1982 I had developed a marketing circle, not a ladder. I drew it out and regularly talked of it with the salespeople of the company I was running at the time. It was a common sermon I preached often. 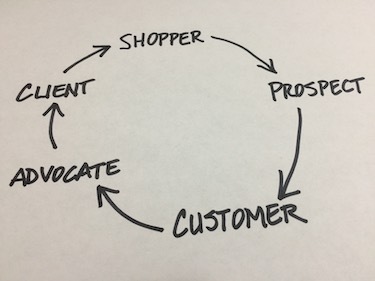 I was running a retail company so I began with the shopper. First, there’s the general public. All the people out there who we think may need or want what we’re selling. But people have to self-select. They have to figuratively raise their hand and declare, “Hey, you’re talking to ME.” For our purposes those were shoppers. Shoppers became prospects whenever we came in contact with them. I’d use tire shopping to illustrate the point. This morning, somebody is going to get in their car and the last thing on their mind is shopping for tires. Their tires are fine. Or so they think until they have a blow-out on the way to work. Now, suddenly they’re shopping for tires. If we’re operating a tire store we don’t know anything about their shopping until they contact us. When that happens, they’re now a prospect (short for a prospective customer). It means they’re a potential buyer. Just here I’d interrupt my sermon and draw a line connecting PROSPECT to ADVOCATE. I’d get puzzled looks, but explain with a true story. I sold him nothing. I gave him less than 5 minutes of my time. I never got his name, but for years he has served to illustrate how we can take somebody straight from PROSPECT to ADVOCATE. From PROSPECT we go to CUSTOMER. That is, we take somebody from looking to buying. They actually do business with us. Now here’s the sad truth. Too many of our customers never become advocates. Marketing includes – I think it especially includes – the experience we provide people. No matter if they’re prospects or buyers (customers). Don’t be transactional. Don’t just focus on getting a sale. It’s important that we focus on creating a customer who is happy enough to tell other people about us. You don’t see referral listed on my circle, but every ADVOCATE refers people. That’s what advocacy is all about. Telling others about it. I grew up in the era of negative advocacy. Somebody in the neighborhood would buy a new car. We’d all go oggle it. The husband would likely tell the other men how much he loved the car, but how much he hated the dealership where he bought it. It was word of mouth alright. Bad word of mouth. They got his business, but the experience was so dreadful he couldn’t tell a good story to his friends and neighbors. That’s bad marketing. I gave a gentleman shopping for a 25 cent fuse something to talk about. Something good to say about us. My objective – and what I think should be every objective of marketing – is always to create ADVOCATES. Anything less is a failure. I know you can’t convert everybody, but you can try. In my circle, the next stage was CLIENT. Back in the 80’s when I first crafted this circle I just meant somebody who is now a repeat customer. We wanted people to buy from us, then keep on buying from us. A transactional mindset doesn’t focus on that. Transactional operators just concentrate on making a sale. They worry about making sales every hour, every day, every month, every year. The lifetime value of a customer isn’t much of a priority to them. They’re playing for the short-term gain. Do that if you want, but don’t expect to build a super strong customer base because you won’t. I’m a big believer in customer base! Note that I also believe a person can become an ADVOCATE before they ever make a second, or repeat purchase. One encounter with us should be enough to make people HAPPY. Not satisfied. Happy! Satisifed people don’t ADVOCATE for you. Only happy – supremely happy – people do. And there it is. Our most important job. To make our customers happy. But first, we have to make our employees happy because they’re the ones serving our customers. It’s all marketing.